While visiting the Grand Canyon in 2011 my camera became my friend. The Grand Canyon at Lipan Point, South Rim. The Grand Canyon is absolutely visually stunning, so much so that it can't be fully appreciated simply by looking at it. You are indeed observing the aftermath of a massive uplift, millions of years of erosion and damage from violent flash floods as well as deterioration and exposure of sedimentary deposits from an ancient sea bed where plankton and sea life laid down concentrated deposits of calcium. The reddish hue that is so pervasive throughout the Canyon is the result of iron that permeated the mineral deposits, now rusting from being exposed the the oxygen of the atmosphere. The Grand Canyon is an amazing place! Yet I found that when gazing out over the Canyon with the naked eye its features became lost in the overall view. The Canyon is so large and so visually busy that the mind simply can't take it all in. Even when you focus on specific features and attempt to visually isolate those features, their distance from you causes a frustrating loss of detail. Large features 5 miles away and 2,000 feet below are still distinguishable and have their own unique personality. Yet, with the naked eye you can't quite see the details of the untold number of boulders that have broken away from vertical rock walls and tumbled down slopes of various angles, or the plants that manage to thrive that endure the harsh landscape. The size and depth of the Canyon adds to the difficulty of focusing on features, even large features. Gazing out over its expanse, the Grand Canyon is beyond comprehension, visually speaking, and its details tend to meld together. But when I raised my camera to this wonderful scene and peered through its optical viewfinder, I was able to isolate selected features by "framing out" the overall vista. That, at least, calms down the situation, visually speaking. The restrictive nature of the optical view finder actually becomes a benefit in this situation, allowing me to see less. So now, with the targeted feature isolated, the feature can be examined absent of peripheral visual clutter. The image below is a shot of a feature within the canyon that illustrates feature isolation. You'll note that the shot below is of a feature that is in the lower middle area of the image shown above. With a lens of decent telephoto capability, the targeted Canyon feature can be drawn in, visually speaking. Now the boulders resting on slopes have a better presence. The strata of the targeted feature is more pronounced. The pattern of the pervasive reddish hue can be distinguished. If for just a few moments, the targeted feature is the Canyon - that's all there is because that's all you see. Now it gets interesting. The camera not only momentarily restricts our view of this wonderful scene by the mechanical and optical limits of its viewfinder, but it alters it's visual personality due to the nature of lens optics. 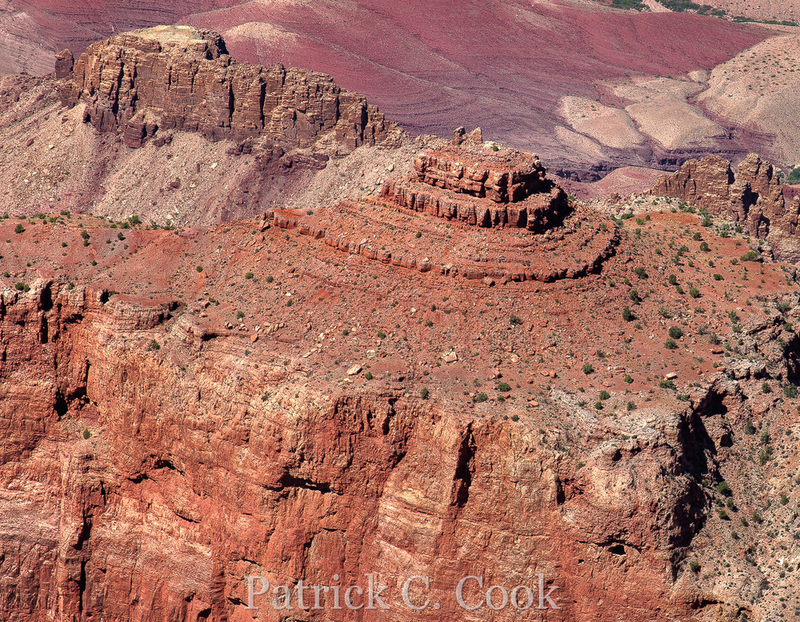 That telephoto lens mounted between me and the Canyon's feature visually draws in the feature, but it also compresses it visually as illustrated below from the Rim Trail. Now the perception of depth is lost if I don't compose to avoid the compression, but I do get better feature detail. I've read articles that advise you to bring a wide angle lens to the Grand Canyon because you want to capture as much of the Canyon as possible in your photographs. Seems like sound advice and I most certainly took plenty of wide angle shots (I can crop on features later if I choose). But, it seems to me that capturing a wide angle view in a photograph is replicating the problem of the mind being overwhelmed with the epic vista. This was suggested by the following story; I returned from the Grand Canyon with a great many photos, of which I selected 212 as the best images. I then went to great effort to present 60 of the best in a professionally printed book with each photo in an 11x14 inch size, never split by the book spine. Every person who viewed the book would flip through the 60 pages in a time span that was shorter than the time it took me to process one of the images of the book. What's going on with that? Perhaps it was too much work to stop and really look at the photos. But I think their minds were overwhelmed with the visual intensity of the images. I could perhaps make a career studying just that one phenomenon. But aside from the actual photos I came home with, I had a unique advantage as a photographer at the Canyon - I was able, with the aid of my camera, to visually isolate certain features of the Canyon. Not just to obtain impressive photos, but to enjoy the experience to a greater degree. I would stand and gaze out on that epic landscape, enjoying the scene thoroughly, and then raise my camera to try to compose an image that would capture the beauty of that place. In this regard, my camera became my friend at the Grand Canyon because, by selectively narrowing the scope of my visual experience with a mechanically restrictive viewfinder, my camera ironically allowed me to see features of the Canyon I might have otherwise overlooked.